Some of you may have found the site already in my Links: www.overlandtours.de, this is my good friend and ex-colleague Steffen, with whom I worked several years (6,7 or 8? Oh my!) in Germany and Singapore, when we both were still employed. 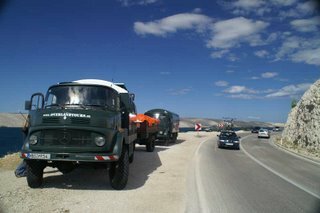 He is currently on his way to India, with a couple of old, but colourful ‘Bundeswehr‘ (german army) trucks and half a dozen people on motorbikes. They passed already Austria, Croatia, Slovenia, Albania, Greece, Turkey, Iran – currently trying to pass through Pakistan. It’s kind of like a serviced journey, with some experienced travellers organizing the whole trip for the others. The organizers planned the whole route over the last months, took/take care of the places to stay overnight (safe places for camps and hostels only from case to case), border crossings, Visa management and shopping for common cooking. The guide trucks (2 x 4WD lorries) carry plenty of tools (even welding torch) and mechanics can support fixing all joining vehicles if necessary (to arrive at the next garage at least). For emergency cases they are equipped with satellite telephones. A Medical Emergency Assistant travels along to provide first medical help until treatment by local doctors is possible in worst cases. There is a travel blog as well under http://overlandtours.blogspot.com/, although most of its content is in german only. So far they had to struggle their way trough over steep and slow mountain passages, having crossed the Bosporus, huddle with unwilling gas station owners and bribe a few official to cross borders smoothly and timely. Due to advertisement tags on all trucks, they are easily recognized on their route and people flock back to his website as well, leaving excited comments. I’m especially happy for Steff, that he really made it happen – after talking about that plan for so many years. Sometimes it’s hard to find the time, plan ahead and make yourself free to go on such a ‘once-in-a-lifetime’-journey. I bet, it won’t be his last. So far it’s still open, if the former asian gang will meet around Christmas in Goa, let’s see. 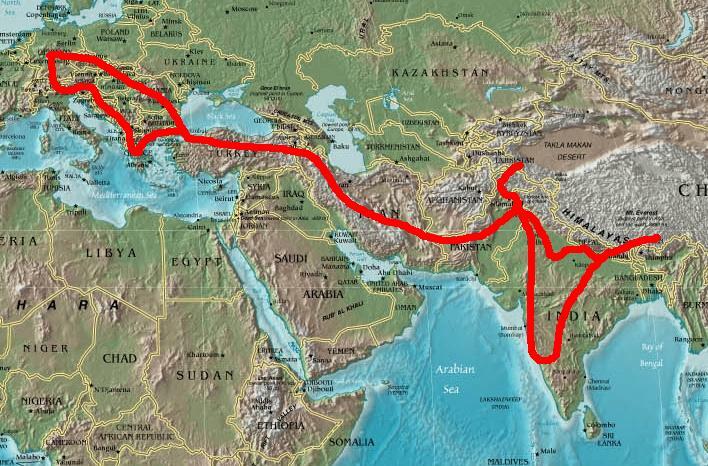 They still have to make it through Nepal, Tibet and partly China. What will come after? 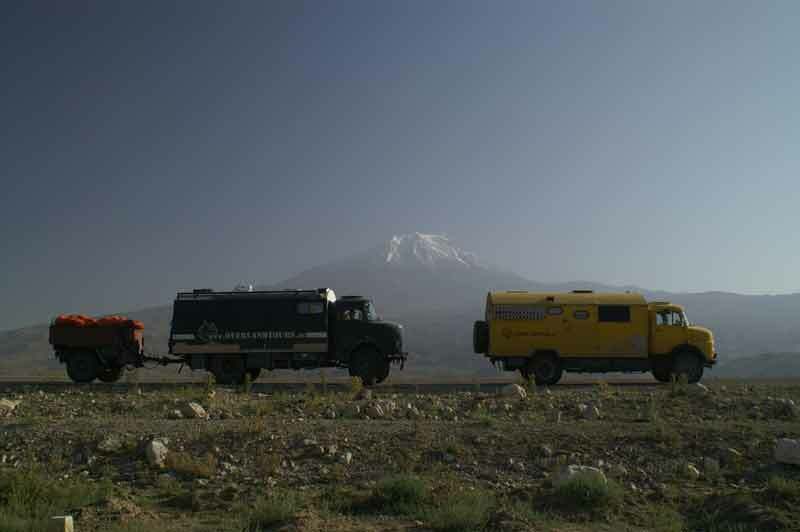 A trip down the Panamericana in South America? Or back to the dunes of Nigeria in Africa? We will find out, stay tuned….